“Where am I?” I’d wonder, once again awakening cold and shivering. 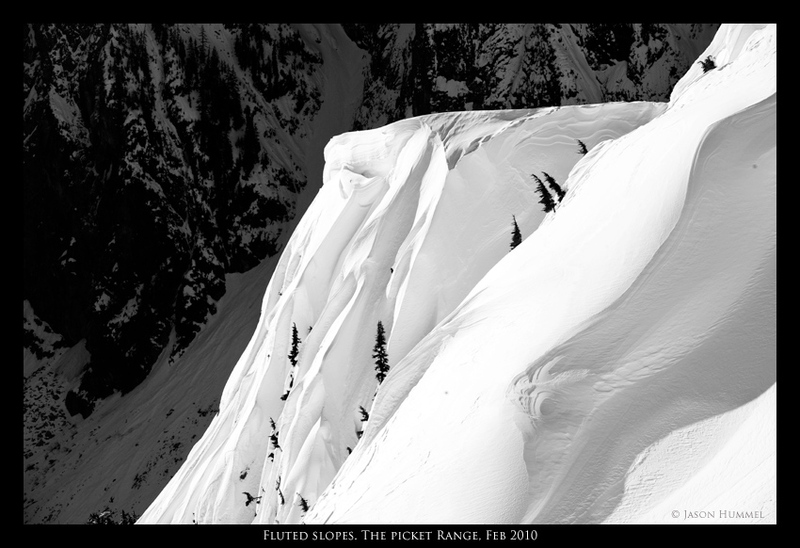 It was then, looking up, I’d see the specter of my nightmares – the Picket Range looming overhead, beguiling me with her contours of ridge and arcs of slope. Answering my own question, sprinkled with obscenities, I’d try to fall back asleep, sporadically waking over and again, each time grasping that I was indeed in the Pickets and scared as hell they’d keep me there forever entombed in those moonlit fingers of snow and ice. 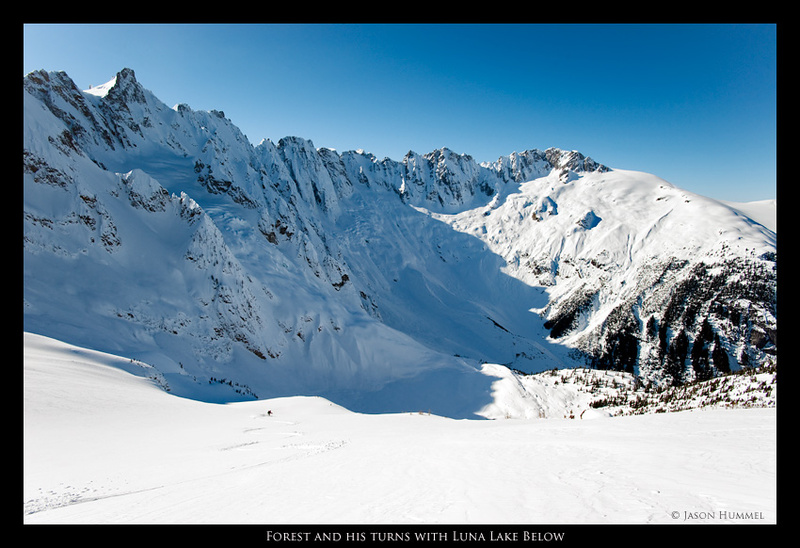 For six days, Forest and I would cross Stetattle Ridge, down into McMillan Cirque, over Mount Fury, down into Luna Cirque, over Mount Challenger, down Perfect Pass, then out via the Mineral High Route to Hannegan Pass Road. 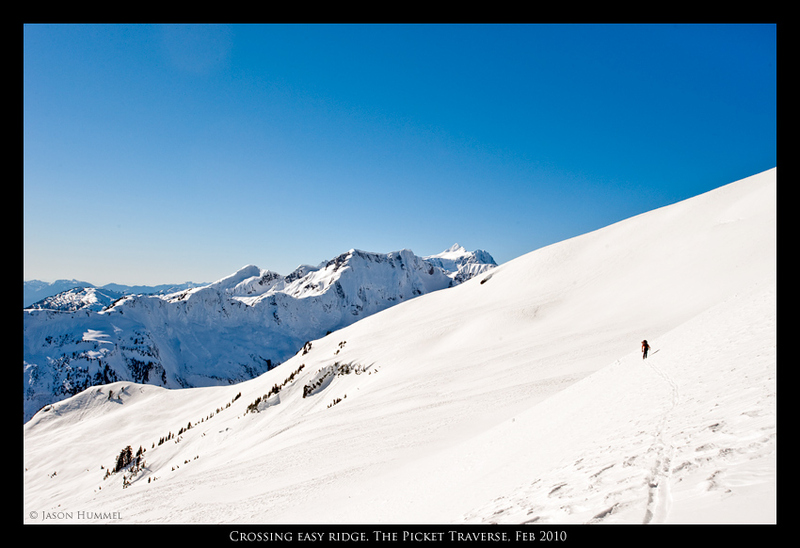 We would complete a high traverse of the Picket Range in the middle of winter, crossing perhaps 50 miles of some of the most wild and remote mountains in the lower 48. Monday morning, before the trip, I’m staring at an e-mail from a guy I don’t know. 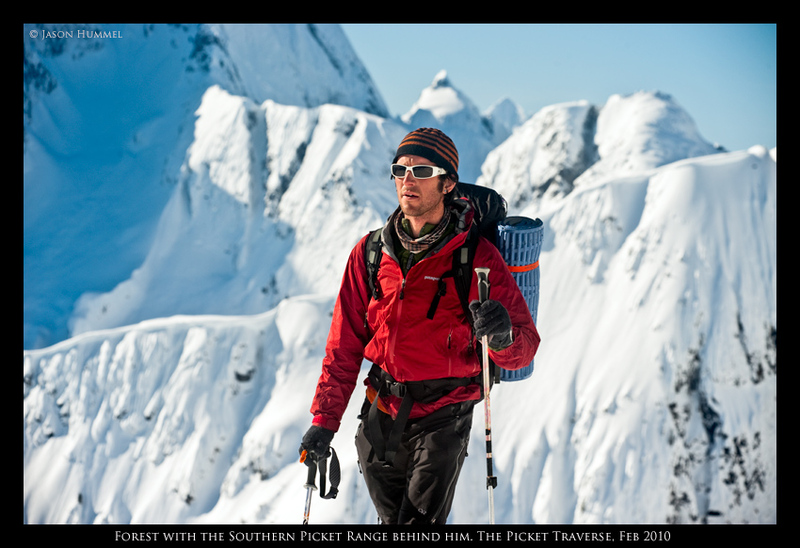 It says, “I'm headed to the Pickets for a ski traverse during the approaching high pressure system, and I'm looking for a partner.” Forest McBrian turns out to be a single test away from becoming a fully certified AMGA guide; he will be one of a handful in the entire country to receive all three certifications. 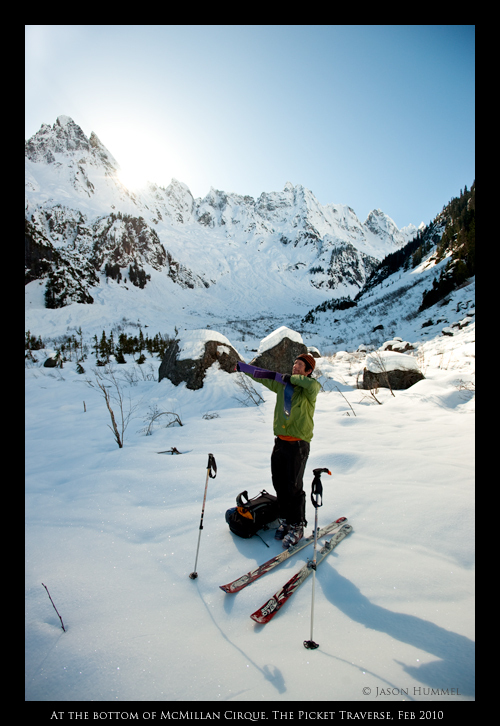 Having completed his alpine and rock climbing disciplines, he has one remaining – ski mountaineering. I can attest that he won’t have much difficulty passing, and I couldn’t have asked for a better partner for a journey such as this. 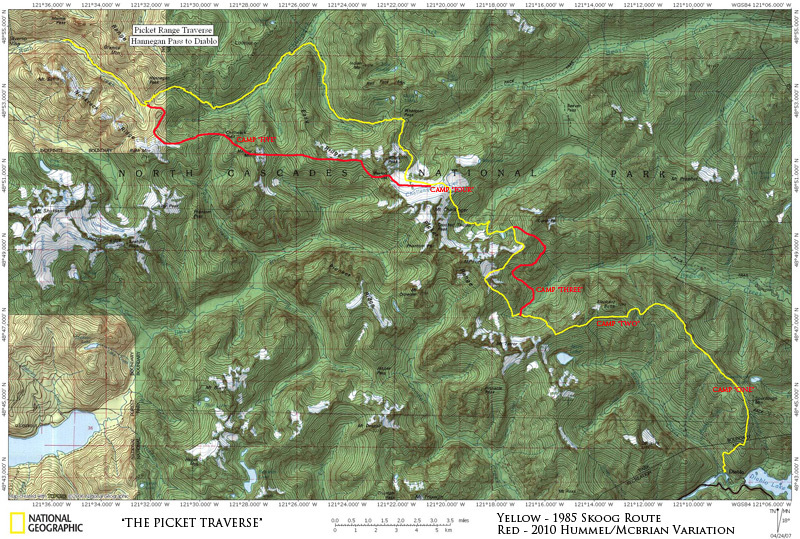 In May, 1985 Jens Kieler along with brothers Carl and Lowell Skoog pioneered a ski traverse through the esoteric Picket Range. They would be the inspiration for our trip. In the quarter century since, to their knowledge, no one has repeated this impressive feat. You can read more about their adventure in the 1986 article Lowell wrote for Rock and Ice Magazine (see link). Lowell says near the conclusion of his article, “…as we plodded slowly down the steep trail to Diablo, our legs were wobbly, our hands and faces sunburned, and our feet aching. But our mountain souls were soaring. 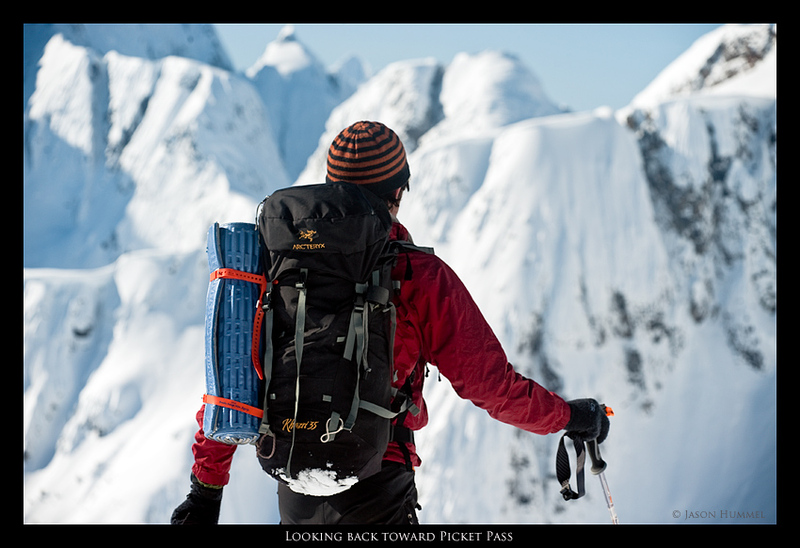 We had skied the Pickets, and in so doing had found the climax of the North Cascade high routes.” My hope was that our mountain souls would also soar and stay aloft through any number of failures that could beset us and force an early retreat. Leaving Diablo Lake at the 900-ft elevation with skis and boots, overnight gear, and a healthy dose of optimism, Forest and I, joined by Kyle, would begin our climb through thick woods along a steeply winding trail up to Stetattle Ridge, near where beat poet Gary Snyder spent the summer of 1953 as a fire lookout. His story among others is featured in the book, Poets on the Peaks. 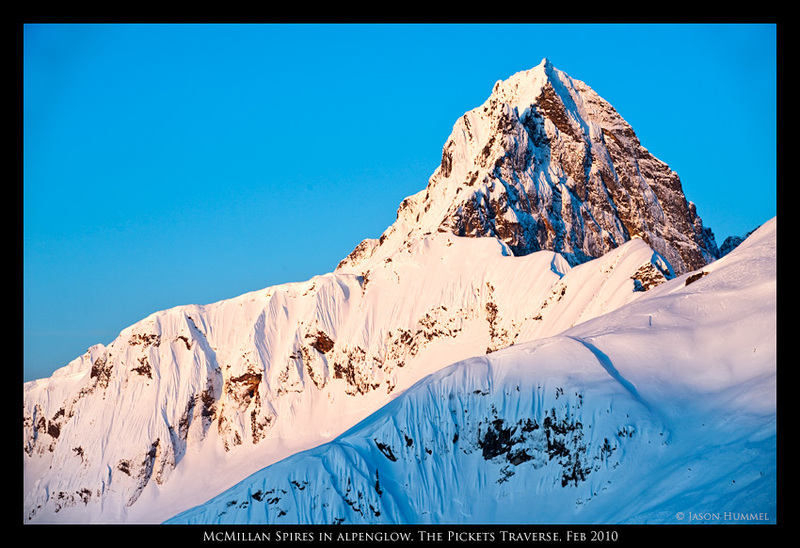 As we raise high enough to put on our skins, and higher still where we could peer over ridge top, I could understand why vistas such as these would inspire poetry. Their fire and brimstone, brick and mortar gathers up your breath and steals it away, sheltering you with only their shadows. 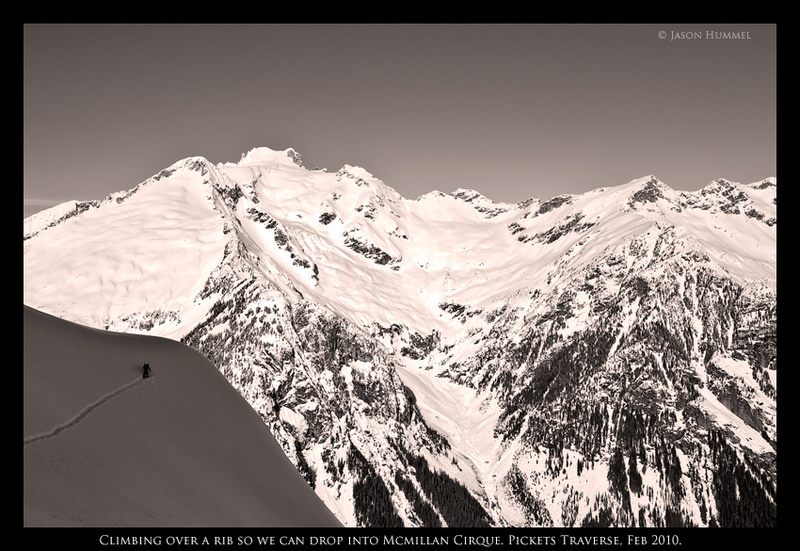 I often become lost on my hike forward, up and down ridge, ever nearing the heart of the range. 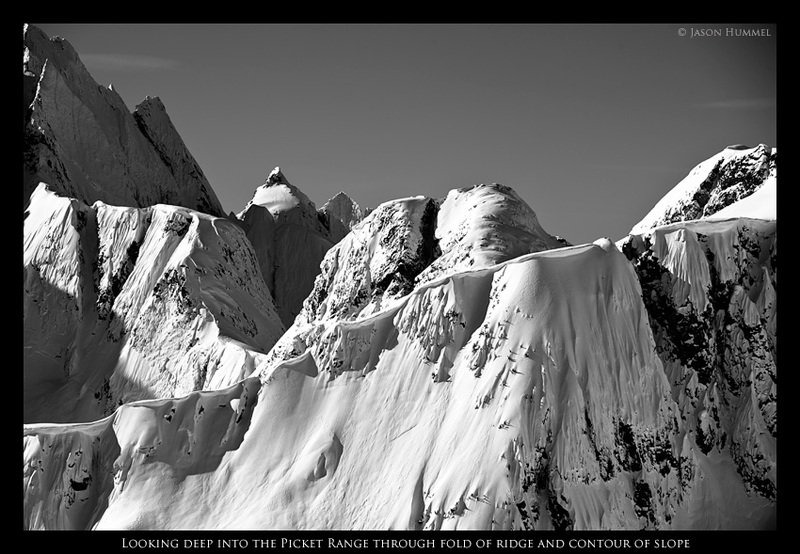 There are times I look deep into mountains such as these, noticing not just a peak, but arms and legs, torsos and heads; where one mountain begins another peeks out, so much so that within this tightly bound range there are at least 21 summits over 7500 feet high. I can imagine there ahead of me, then, the convolution of alpine seductiveness! 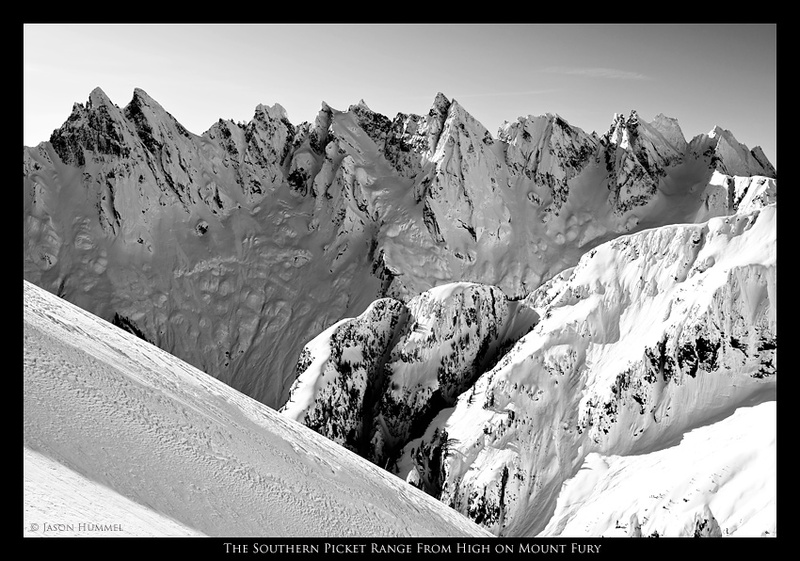 So far I’ve seen no place more promiscuous than the Picket Range. 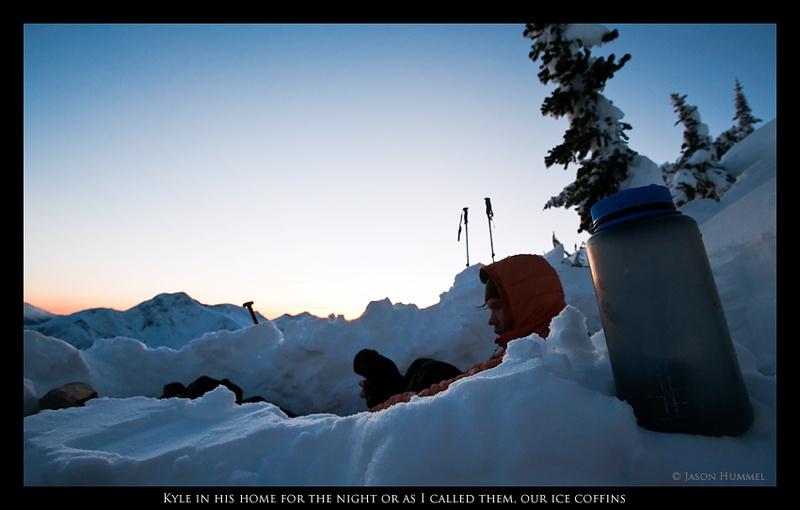 As I carve out my bed from the snow and set up my bivy, I could only think about getting closer … much closer. 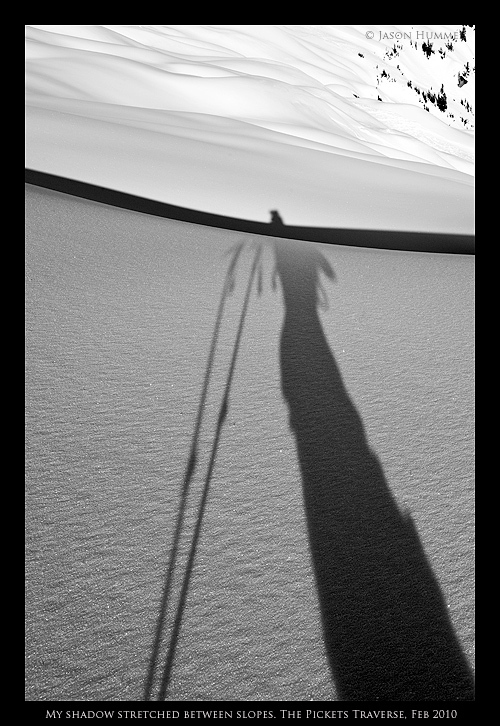 In the following day and a half feet and skis reach forward, and then pull back … forward and back, over and again. Terrain rolls away before eyes. 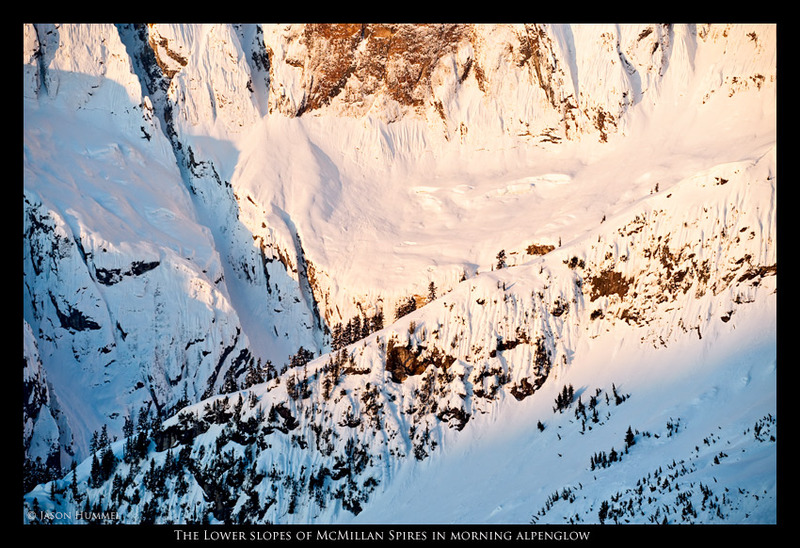 Overhead, up beneath McMillan Spires, a spine of rock and snow bristle with trees. It's amazing where a tree will gain purchase. 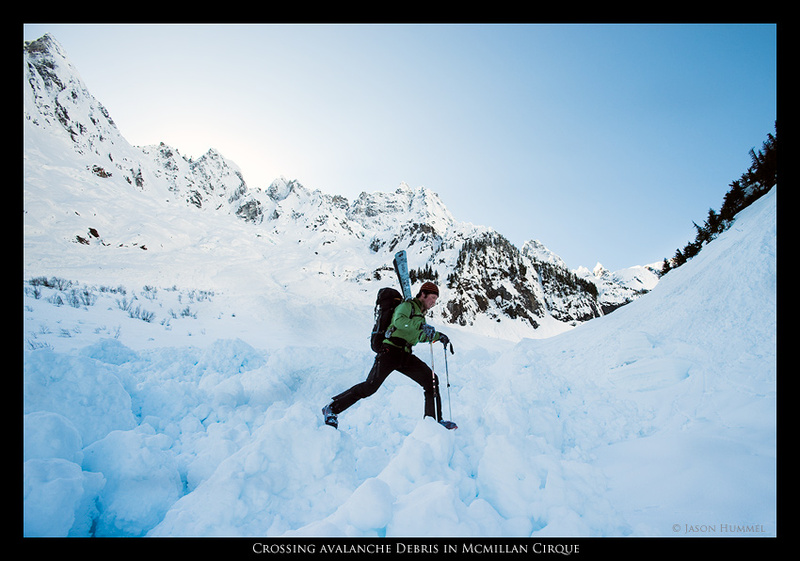 There is no better example of this tenacity than in the depths of the North Cascades where avalanches, icefall, and glaciers encroach on every aspect. Where life has a will, there is a way. Night grows out of shadows like ninjas crawling up from the valleys, cornering us to our bivies, or as I joke to Kyle, “…our ice coffins.” Stoves roar and cooking persists for an hour. Stars tumble from the moon’s glow as the night goes on and on and on – too much for a man to sleep. Early morning on our third day brings warmth as our bodies begin to move. 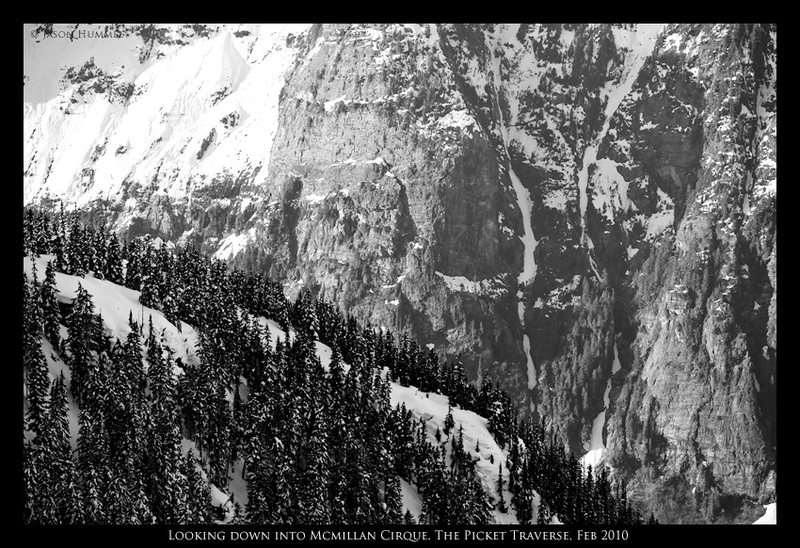 A few hours work and we look down into McMillan Creek Cirque, our three brains firing off – dismantling confidence with the same ire of a bomb specialist in the midst of disarming a potentially destructive device. Each thought of ours rings with a similar note. “Oh my God, I go down there, I am committed!” This is the bomb in the closet: red or green wire? Five, four, three, two and CUT. Then the countdown shutters to a stop. 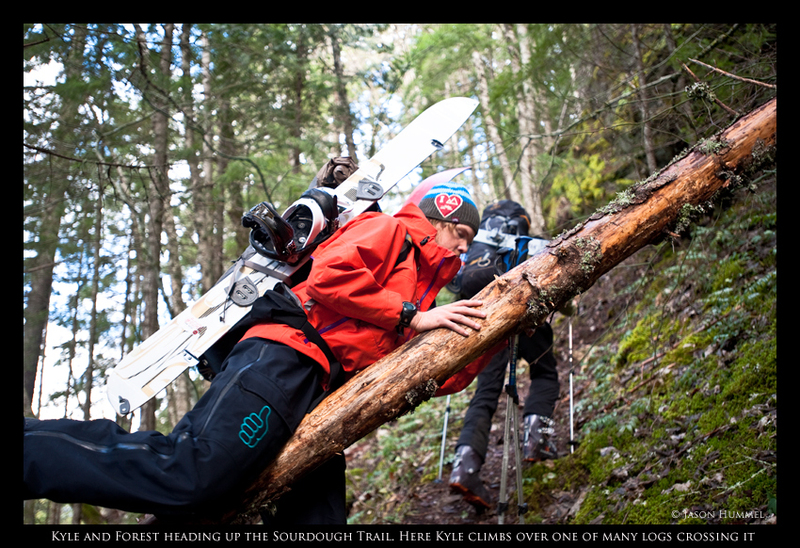 Kyle finds his splitboard the wrong tool for the job – it is like riding a mountain bike alongside a road bike on the highway. Each section of hard snow, ice, avy debris has him stymied. 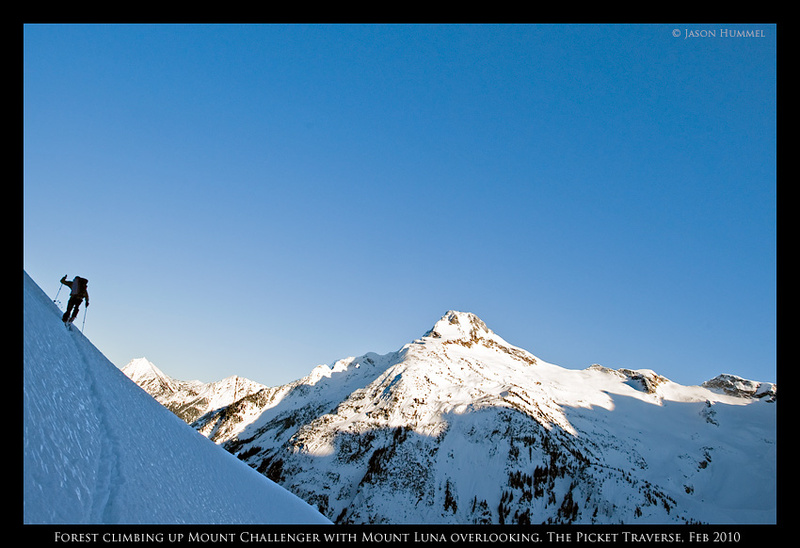 This traverse is not a place for a boarder, and he knows it. 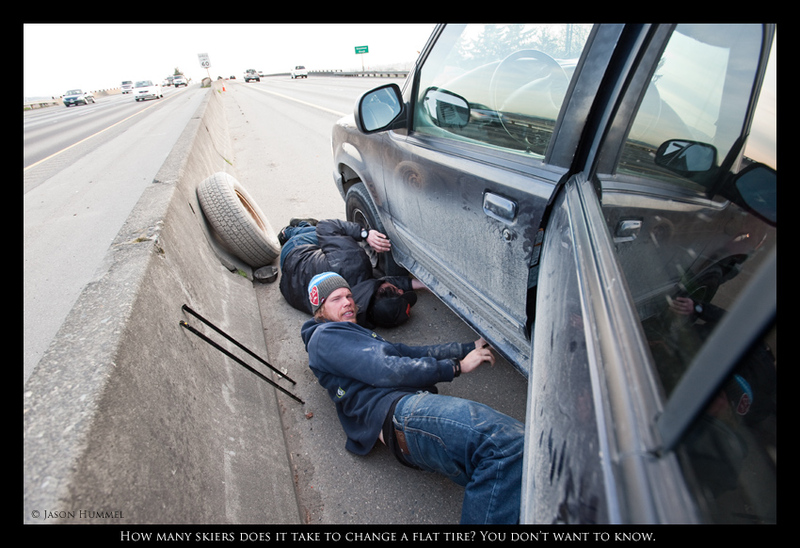 Our ski edges gain purchase where his simply can’t. So Forest and I bid farewell to him as he turns back the way we came. It only takes a moment. I look around and he is gone. Up ahead I still think, “I must get closer!” So close now, I can feel the cold breath of wind sucking me in. 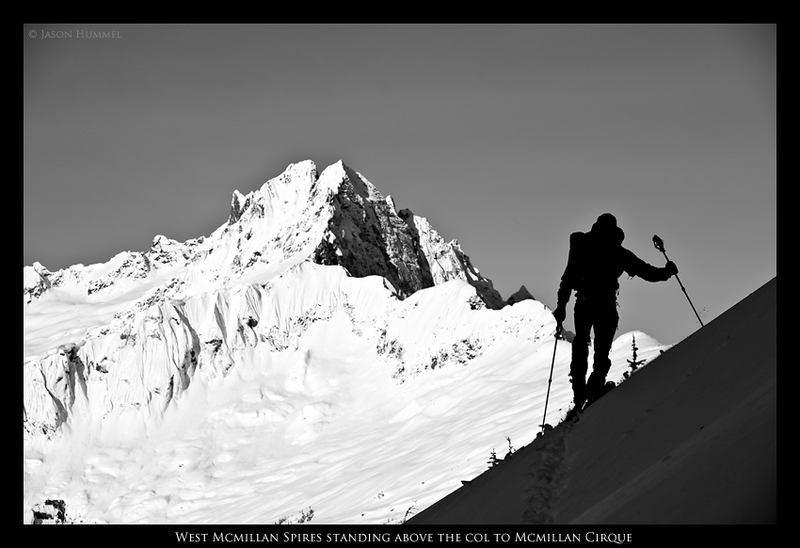 The edge of McMillan Creek Cirque, where we perch, is dominated by cornices. They reach over the shadowed confines of this massive valley. Their unknown challenges sprinkled throughout. Forest drops in with a push and I follow. Negative thoughts of being stranded by foul weather and days of retreat through jungle corridors rankle our self-assurance. Yet, uncertainty is the great mediator. It unclogs the moment and asserts her presence with each turn downward from the untenable slurry of responsibility. With the north cirque walls an hour behind us, all looming and domineering, the sun breaks out from behind Mount Terror and splashes the few precious hours of daily light this valley receives per day. 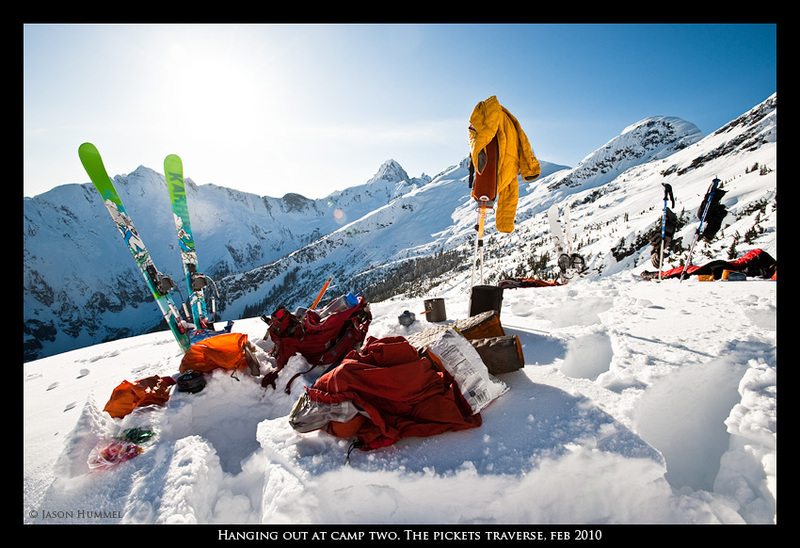 On warming rocks next to a gurgling stream our gear scatters, boots come off and not much is said. Continuing on warming south faces will wait until tomorrow. With satisfaction I pull up another bottle of clean, crisp water and watch light roll in like ocean waves. Bathing in it, all worries scatter. 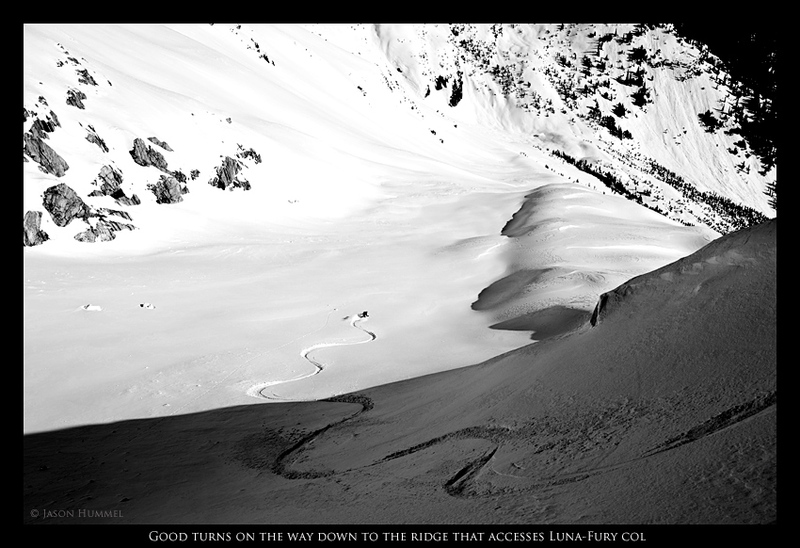 The descent and climb up to Luna-Fury Col looks perfect. 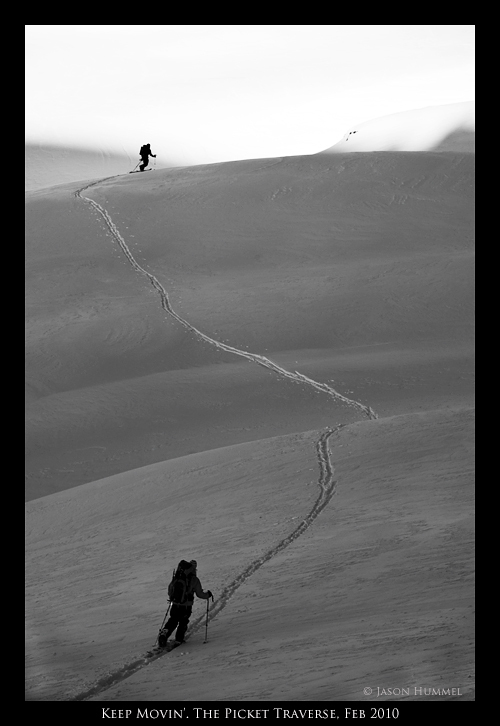 Between cornices, we drop into powder laced with wind board. To us, this is un-bottled perfection all the way down to the bottom to where I follow Forest on a high traverse. 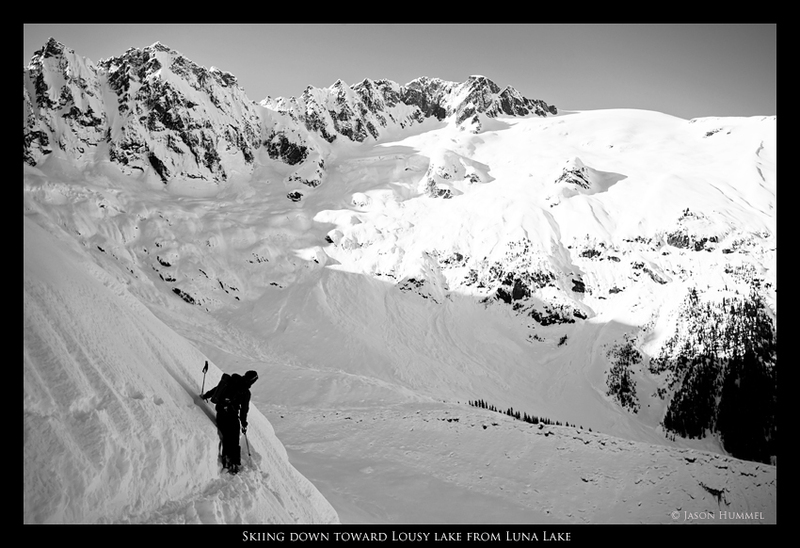 After skins are attached, we continue our climbing until we both look down into Luna Creek Cirque all covered in snow and sprinkles of trees that climb up valley walls like lines of ants from their nest. 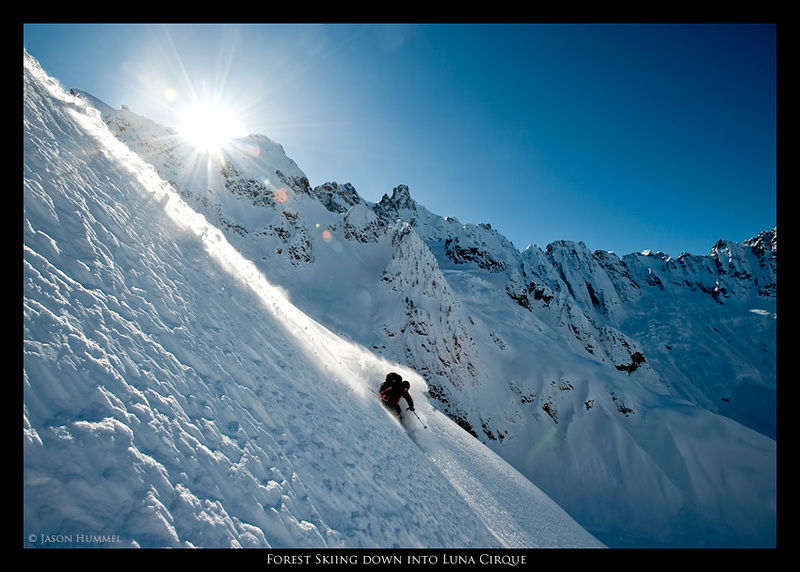 Before we leave, Forest, between bites of cheese, predicts matter-of-factly, “These will be the best turns of my life.” As we glide over the top and descend, I can’t help but think how right he is. 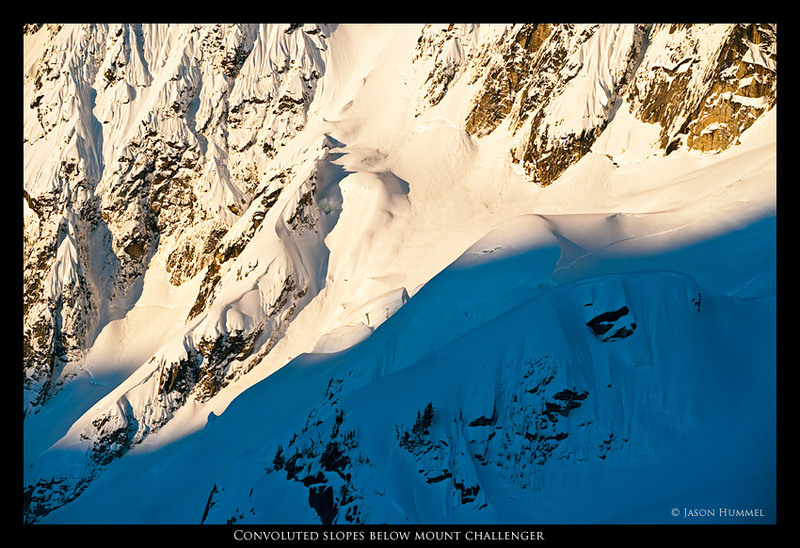 Deep in the bowels, beneath the North Face of Mount Fury, we climb over avalanche debris for hours before finding escape on the Challenger Glacier. Ahead is camp at which we arrive after an 8000-foot day of climbing. Spent legs push me the final bit to where an overlook of the area has my eyes casting about for photo opportunities. 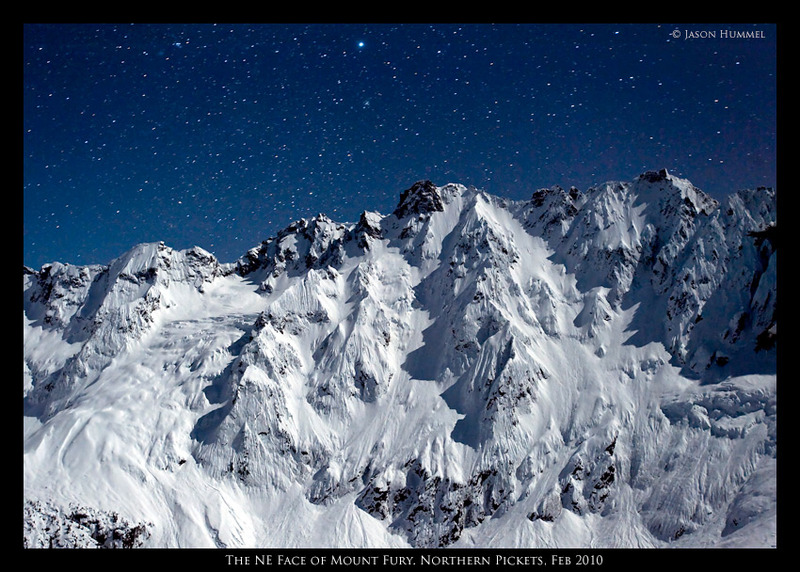 As I flatten out a small bivy spot, I make sure I have excellent views of the NE Face of Mount Fury. 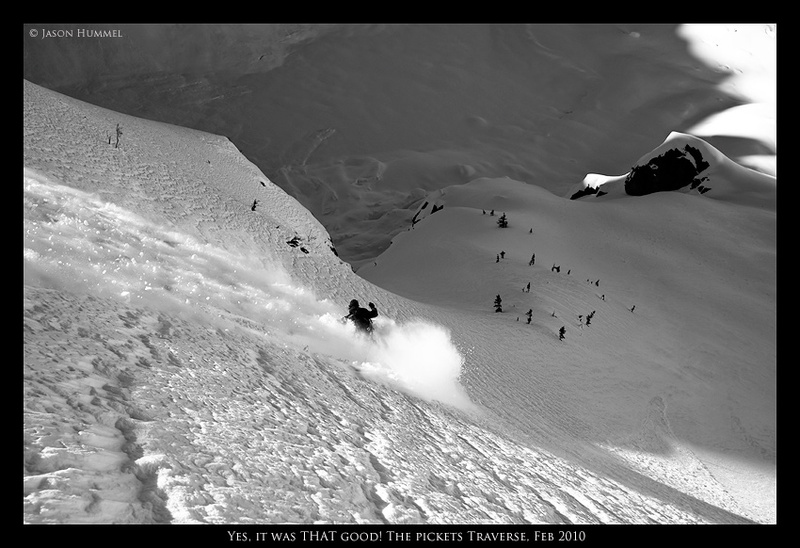 Along with excellent friends, 7 years ago I had skied it in very poor spring conditions; it had been one of the scariest descents of my life. 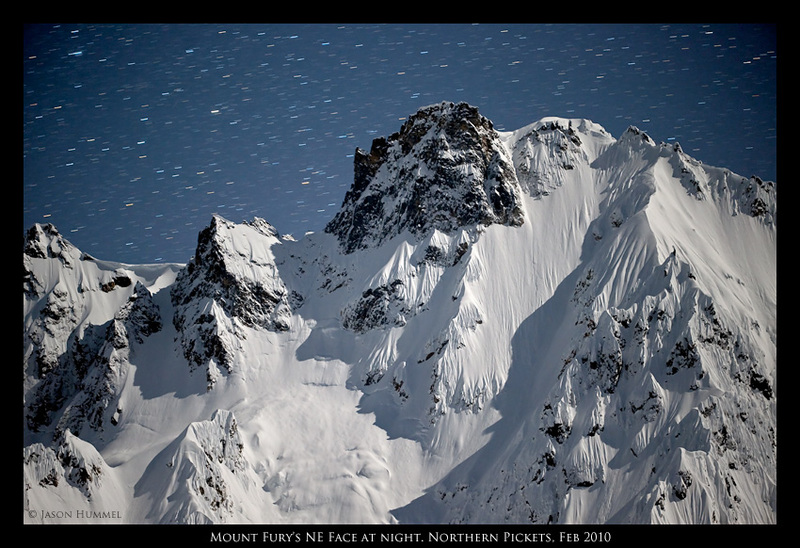 As night blossomed, I flattened out an area for my camera and with numb fingers I spend an hour trying to get that one shot just the way I wanted it – a mountains restless night – and I believe I succeeded. A fifth morning reminds me that it’s winter. In my bag, between shivers I laugh, “How can I be warm and freezing at the same time?” Awfully long nights I could do without! But, as in everything, there is a price. To be here, a spectator to such a place, some discomfort is required. 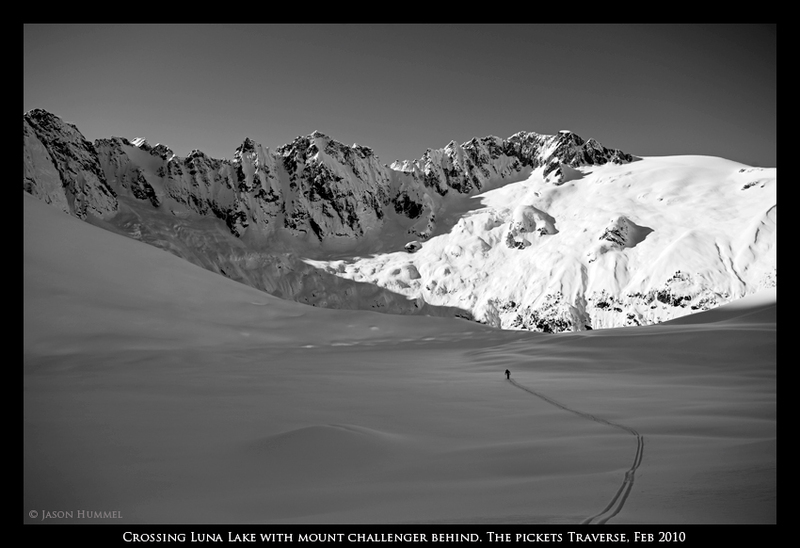 An hour later we climb over Mount Challenger’s broad glacier shoulder, and the core of the Picket Range recedes from view. I pause as “wild and untamed” gaze squarely back into my eyes; how cultivated and tame I am compared to this place! Creaking, my skis continue their journey, forward. 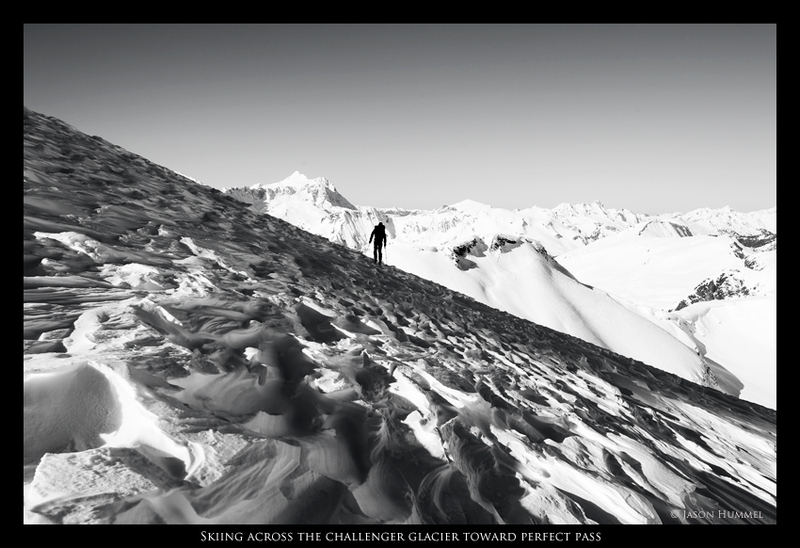 Beyond crevasses and terrible snow, we arrive at Perfect Pass. How these names of the Pickets suit the terrain so well that beyond here little explanation is needed. 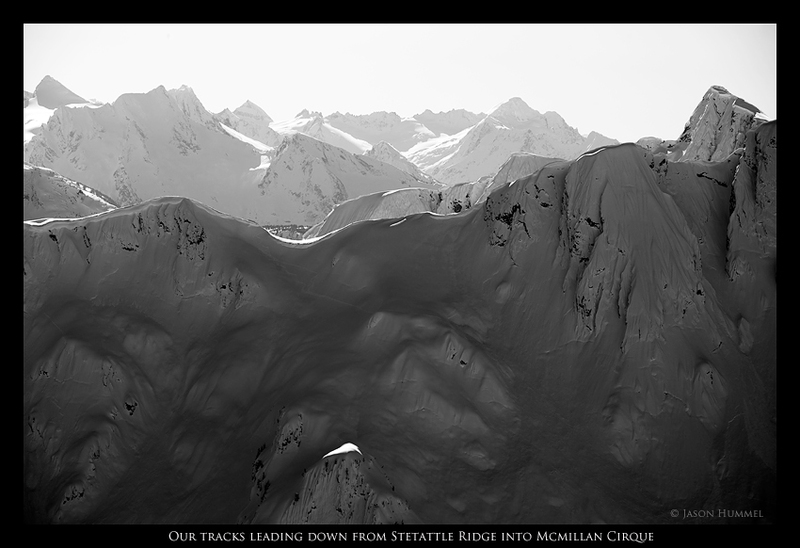 We finagle our way beyond Imperfect Impasse to the laidback contours of Easy Ridge. 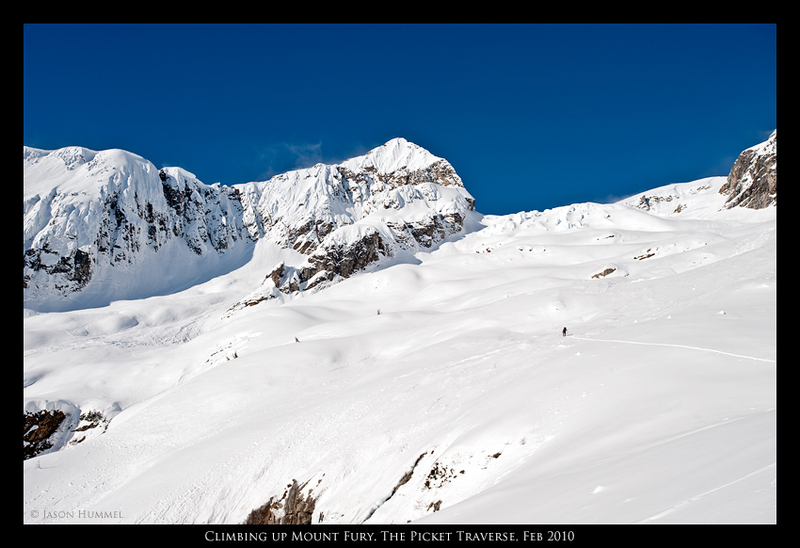 Further along, a choice, we could drop to the Chilliwack Trail or continue on the Mineral Mountain High Route. Since staying high had purified us, any drop to the lowlands would be because clouds had infected our all-encompassing blue skies. Not a germ of white puffiness in sight! To the Mineral Mountain High Route we go. The next 1800 foot climb takes an hour and ten minutes while our descent takes more than that. Like so many Cascade Mountains, the challenges lay hidden deep in the valleys, nestled as a viper in the grass, waiting to strike. 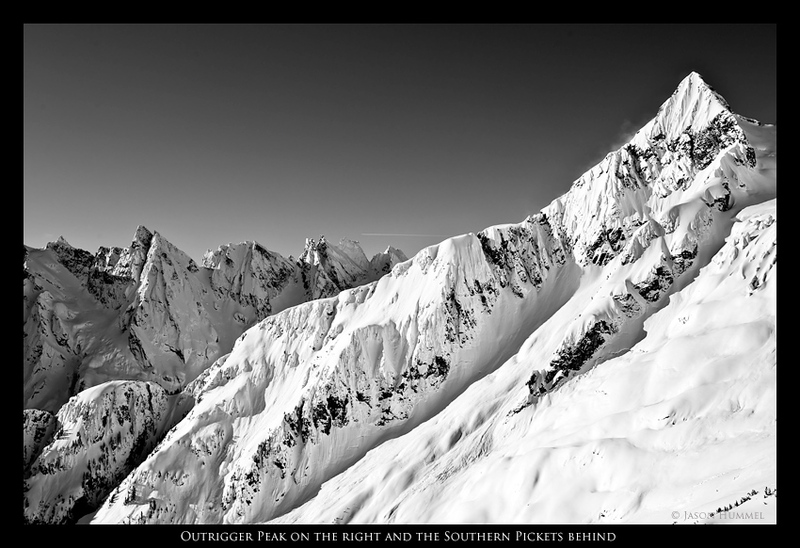 Fangs of cliff on Mineral Mountain’s northwest face force us to side step treacherous terrain, each turn committing us. “Forest, have you found a way?” I croak to him, seeing nothing myself. 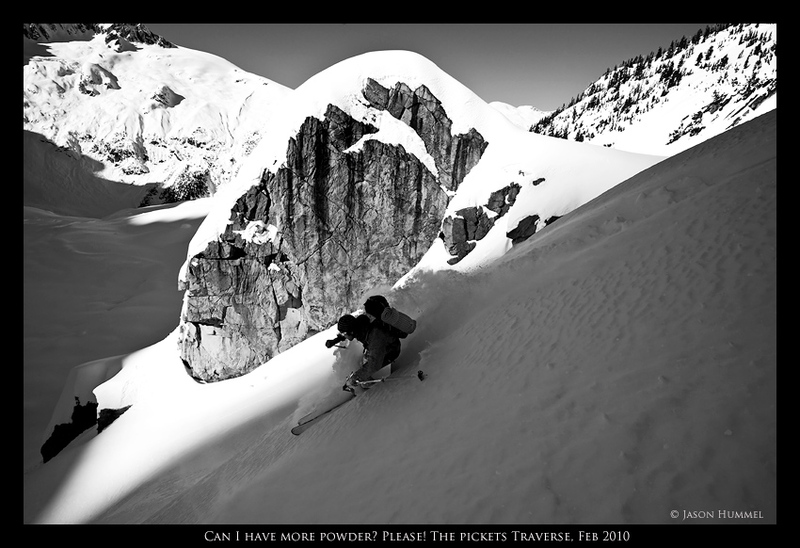 He returns confirmation, “Stay high!” In front of me, a small couloir, as wide as my skis, grants passage to the slopes below, and to Chilliwack Pass. Here is where we decide to spend our final night. 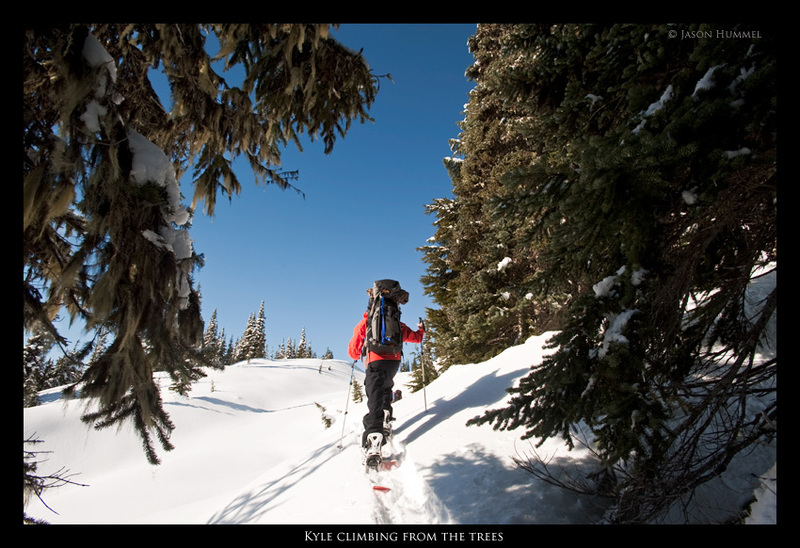 Day six brings us up from the trees onto the upper slopes of Ruth Mountain. A sun’s greeting comes upon us as we climb out from the shady, powder filled slopes onto the sunlit landscapes rolling away ahead. 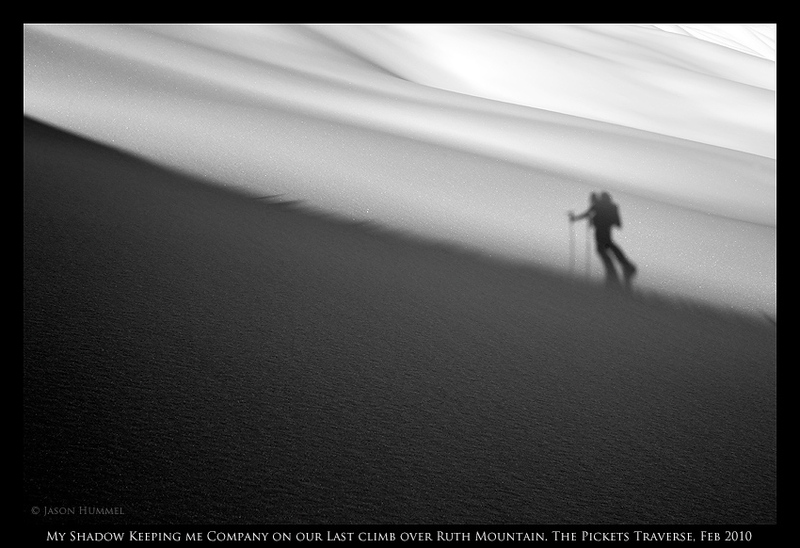 Eventually the traversing ends as we round Ruth’s west face. In the cold breeze we eat the scraps of food we have remaining. Neither of us seems in a hurry, both knowing that this was it; soon our journey will be over. Submitting to it, I mumble, “We should go.” How soon, I know, we’ll be back to cars, roads, cities, towns, beds, warmth, and food – the easy life. I didn’t need a mirror to know we look haggard, sunburn and beat. While it’s good to not have these creature comforts all the time, you certainly need them some of the time. 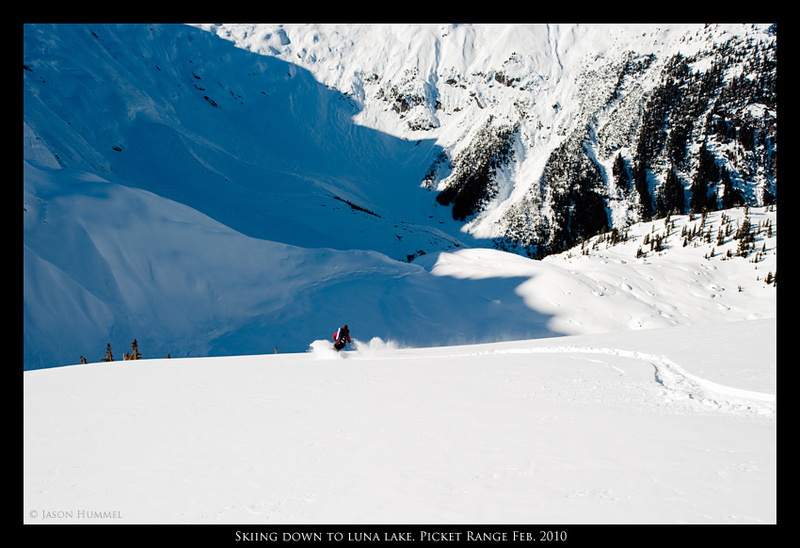 An hour later, my skis shudder to a stop on rock strewn trail lost under a canopy of forest, bereft of snow, and in feet slice free into open fields of white, outlined by the swift waters of Ruth Creek. They soon lay on weary shoulders as I hike dry patches of road. They are no longer racing uninhibited from the firm grip of the unforgiving Picket Range. And unlike Forest and I, they are unafraid. No matter how often I visit, I will always awaken fearful of these mountains. To me that’s what makes them so extraordinary. THANKS for reading!!!! 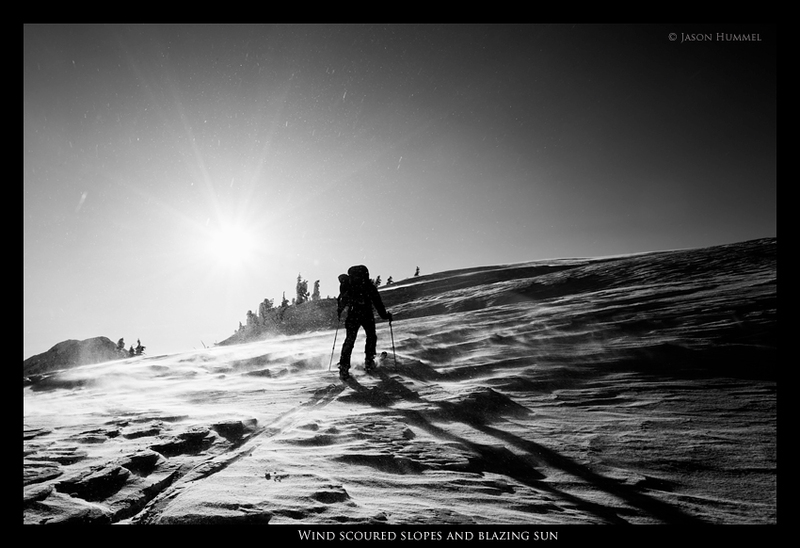 ~Jason Hummel More photos: see Alpine State OF Mind. Or CONTACT ME. If you enjoyed your visit, tell us about it, go to the GUESTBOOK.